Follow along and stay connected. We publish and share our projects, events, and happenings with you - the Boise business community. If you're not already receiving our communications, please sign up below and make the most of your membership. We don't want you to miss an opportunity to connect and get involved. The Boise Valley Spotlight magazine is our annual membership directory. Together with our publishing partner, the Idaho Statesman, we share stories about the growth and development of Boise. The magazine is available throughout the Treasure Valley and in our office! Update your information for the 2019 issue! Members will receive a mailed packet with information about the annual directory. Please verify your business information is correct by updating your information through our online portal. Questions? 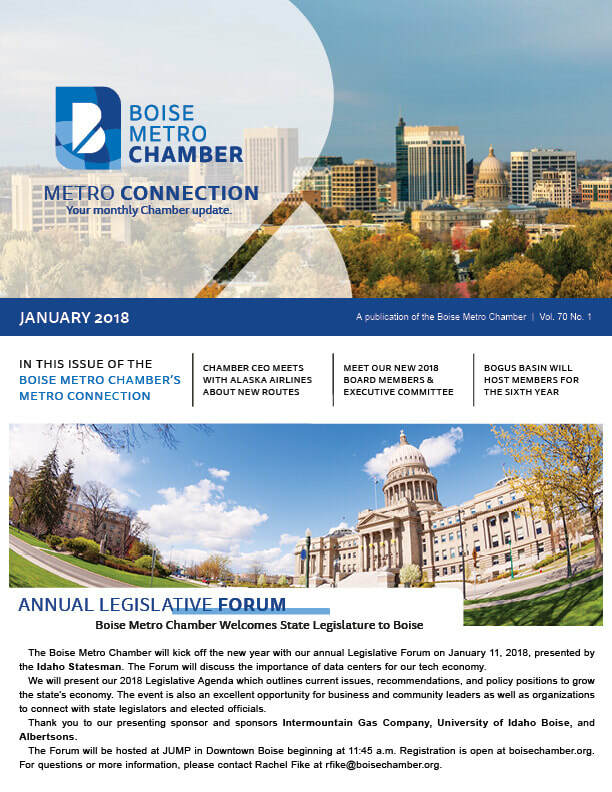 Email communications@boisechamber.org. Each month, we publish the Metro Connection newsletter. The newsletter features member highlights and accomplishments, Chamber initiatives and projects, upcoming events, and photos from across the Treasure Valley. Your membership includes a subscription. If you are not currently receiving the Metro Connection newsletter and would like to update your communications preferences, please click here to request. See our updates right from your inbox or social media feed.